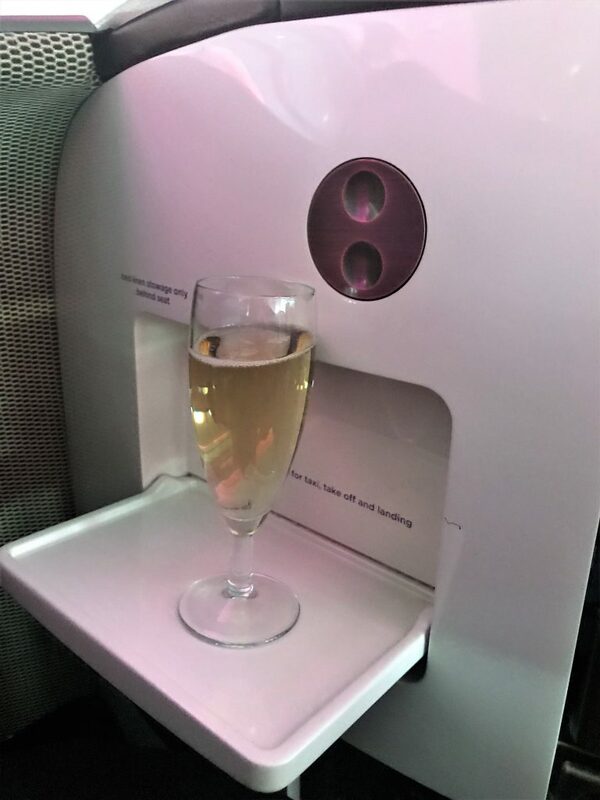 On all my previous Virgin Upper Class flights I had connected through Heathrow on ex Dublin tickets so I had never actually used the Upper Class Wing. 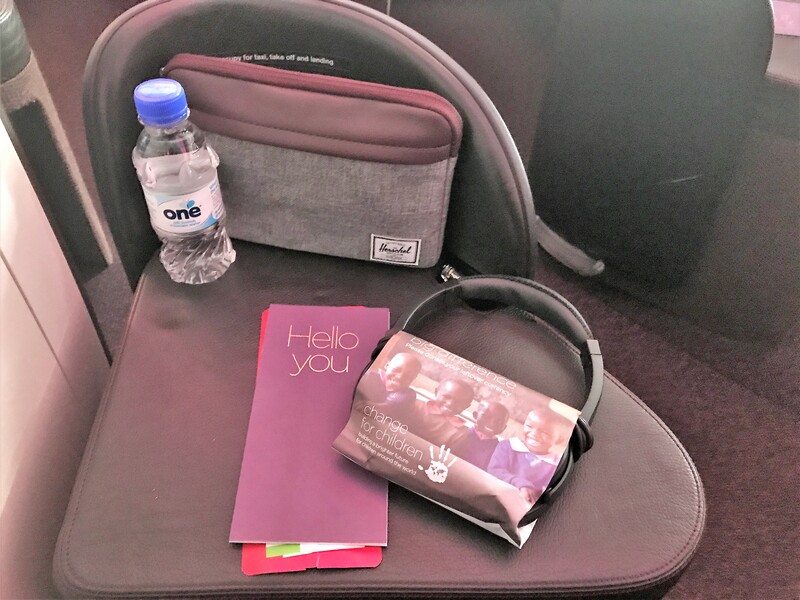 On this one I had used miles to upgrade a premium economy ticket so I was determined to give it a try. The Upper Class wing is quite different to BA’s First Wing and both have their own advantages. 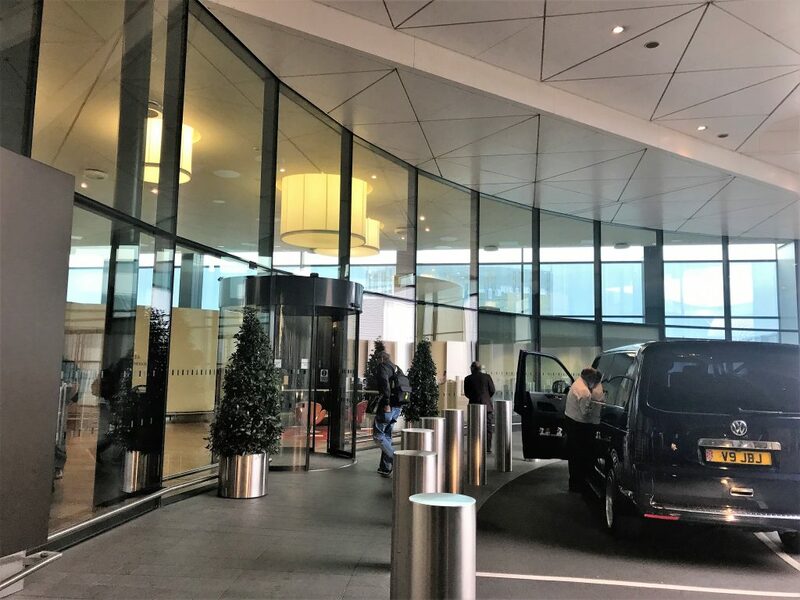 Virgin’s has an entirely separate entrance to the main terminal where you can be dropped off by one of their chauffeurs or by your own transport. 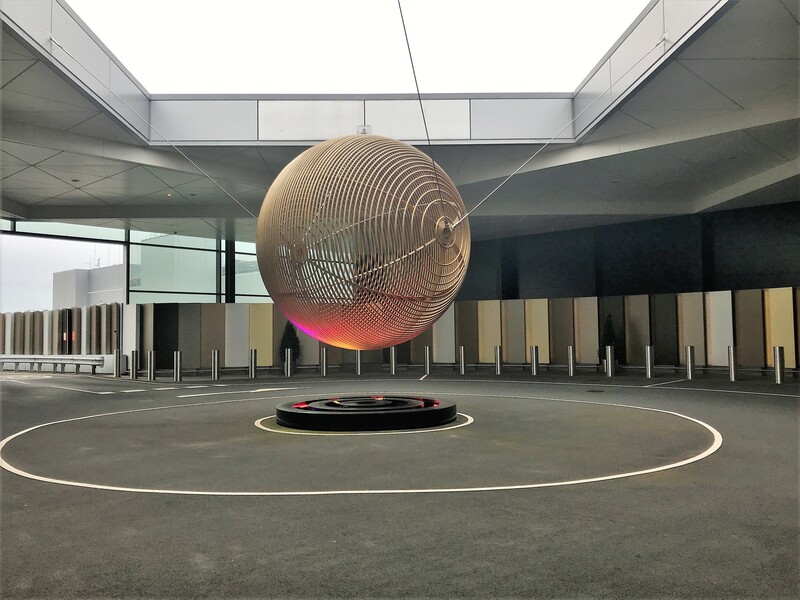 As I was on miles, I had got a taxi to the airport from a nearby hotel and we soon saw the entrance to the first wing on the left through an automatic barrier as you approach the terminal. Up until the security, I found the whole experience very impressive. There is a luxurious entrance to the wing like that of a five star hotel where you are met at the car and your luggage taken. I had checked in online as advised for the Wing and was soon taken to a check desk and given my boarding pass. 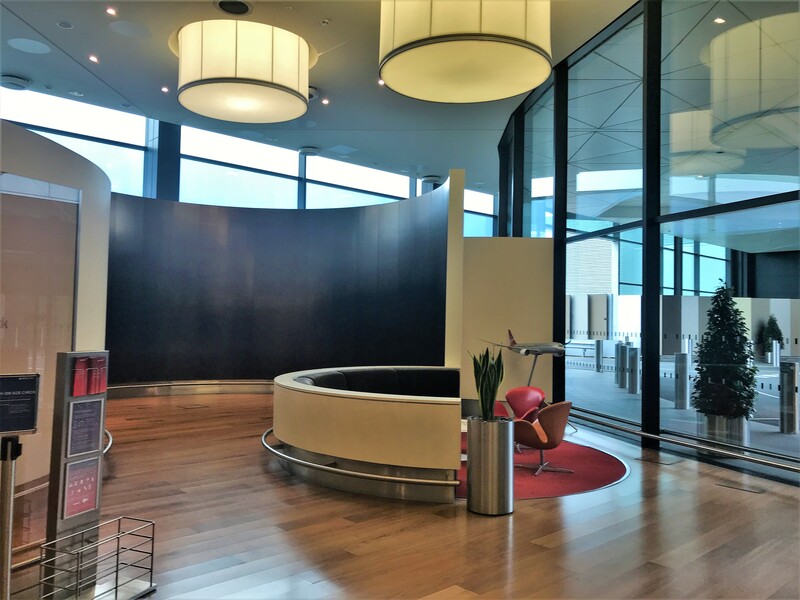 The area inside also has the feel of a private jet or First class terminal with a seating area and being relatively quiet. You used to have to prebook if you were using your own transport but that is not necessary now. BA definitely wins in terms of security as I have never had to wait more than 5 minutes in the First Wing and for the fact that it takes you directly into the lounge. The Virgin one just brings you out by the normal security exit. 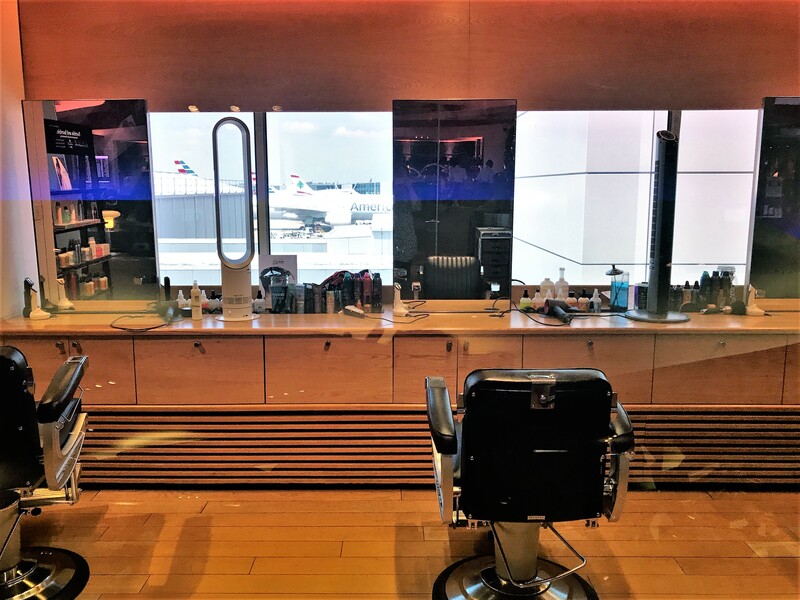 I have reviewed the Virgin Clubhouse many times (read the reviews here) so I won’t go into too many specifics except my experience this time. 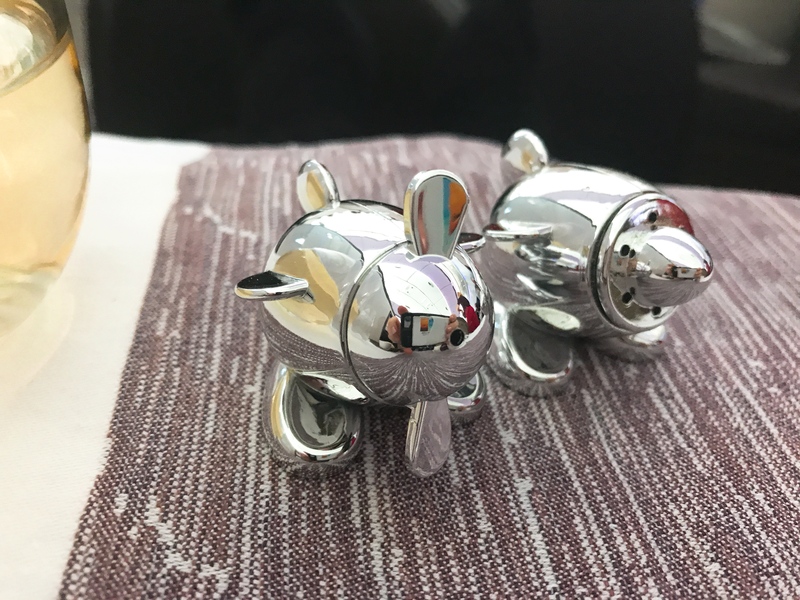 It was mid-morning when I arrived and I was greeted warmly at the desk and asked if I had been before which I had. They offered to store my bag which I declined and then, as usual, my first move was to head to the salon to book some appointments. I have had the Unwind before which was OK but I thought this time I would have the blowout and pay for a longer Thai Foot massage at £35 for 30 minutes. I could have paid 7000 miles instead if I wanted but I did get a 10% discount on the treatment for being Virgin Gold. I personally think the prices are quite reasonable compared to what you pay in a salon. The foot massage was good and the spa was a bit quieter than last time which helped as the treatment rooms are open at the top so it can be a bit noisy. Both the therapist and the hairdresser were lovely and I was pleased with the results of my blow dry. It even lasted well into the evening when I was fortunate to meet up with Patrick in New York who is well known on my British Airways Gold Facebook group and is also a reader of this blog. If you want to see the full menu of treatments and prices including miles, you can find it here. 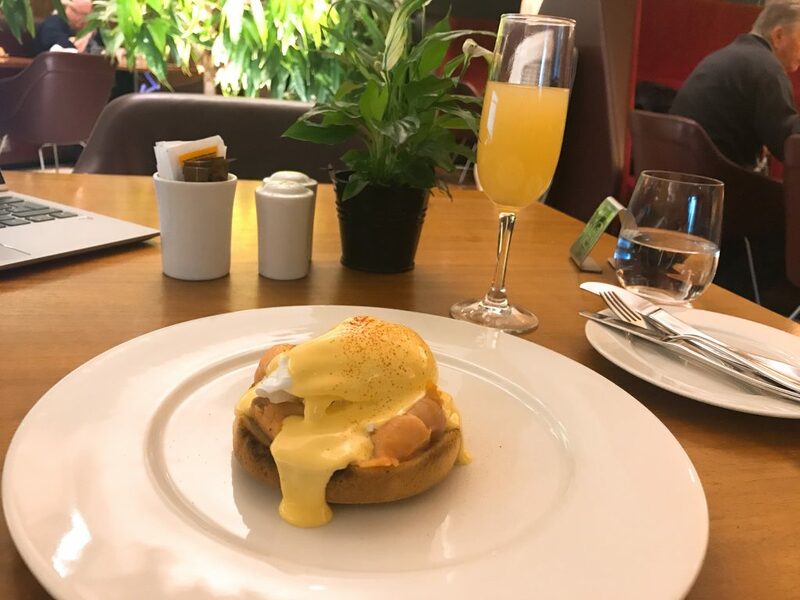 I went for the Egg Royale, one of my favourite breakfast dishes. Like many lounges, the portion was a bit measly with just one egg but it was tasty with plenty of sauce. Naturally, I had a Bucks fizz with it as well as a good cappuccino. The service was good initially but they weren’t quite so good at offering top-ups of drinks. However, it didn’t take long to grab someone to order another drink. 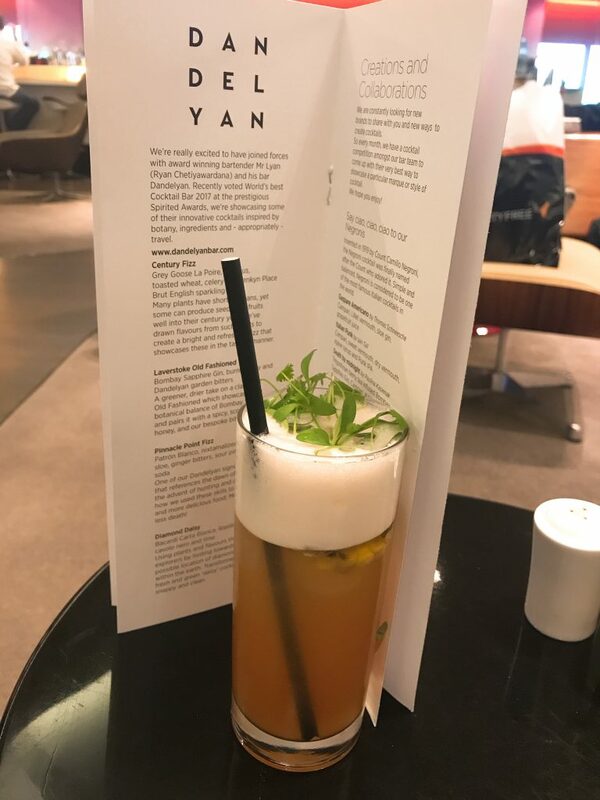 I then headed over to the bar area to try one of the Dandelyon bar (from the Mondrian in London) conceived cocktails before I headed off to board. I had a Pinnacle Point Fizz which was not made with champagne but tequila, sour pineapple and soda. It was a lovely refreshing drink with a touch of ginger. 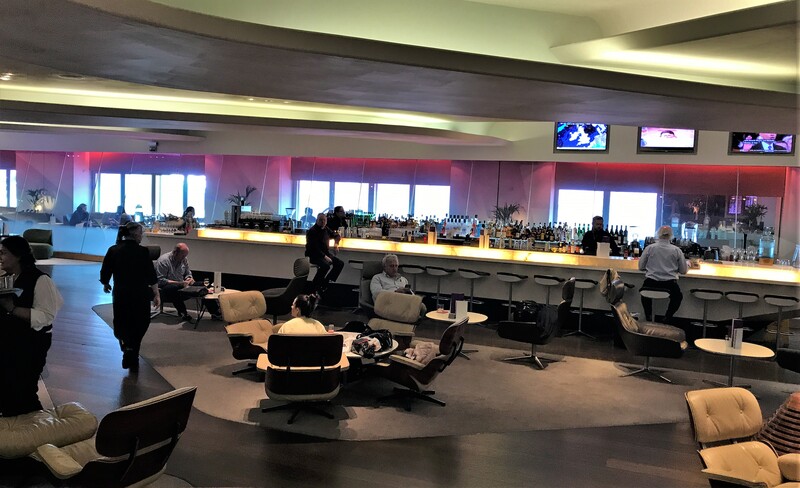 Everything is table service in the Virgin lounge but I will often head to the bar to order for the sake of speed as I did this time. I had asked to be included in pre-boarding so I could get some photos of the cabin whilst it was empty. In the lounge, they make two calls so unless you are in a hurry you don’t need to head off until the second one. Pre-boarding was announced and I made my way on board. The crew were very helpful as I was taking photos, trying to stay out of my way. At the seat were a wash bag, a bottle of water and the menu. The amenity kit contained: Rituals lip blam, body moisturiser and eye cream in a pouch, pen, socks, toothpaste, toothbrush, eyemask and ear plugs. 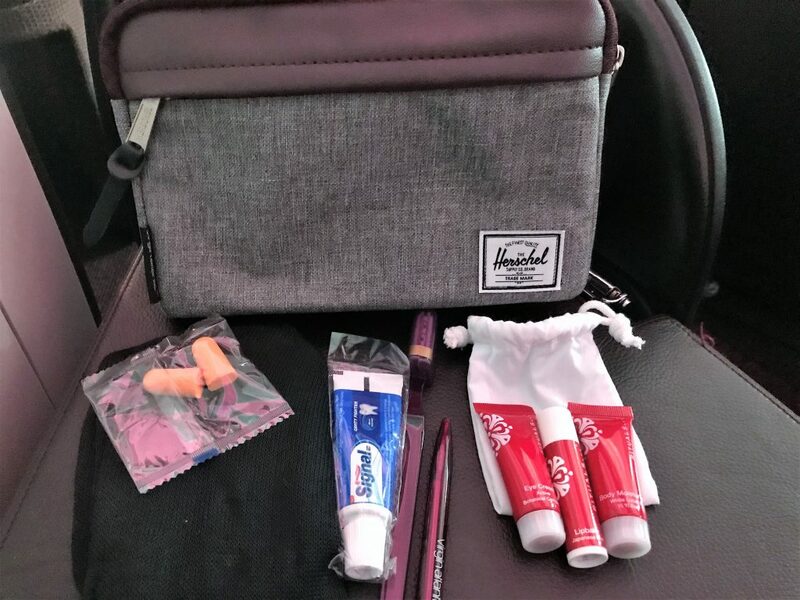 I liked the kit overall as it had pretty much all the essentials and the large toothpaste is the perfect size for a few night’s travelling. Unfortunately, I had been ousted from my seat at some point from making the initial reservation as the aircraft type had changed from a B787 to an A330-300. My nice window seat had changed to a middle row seat with the only saving grace being it was in the middle of the cabin rather than by the bar or the galley. I was pretty annoyed since this happened both ways and by the time I realised there were no other seats available. I should have used Expert Flyer to set up an alert. I was offered Champagne or a soft drink. No need to state what I had! Virgin serve the Canard Duchene Champagne which BA are also now featuring. It is no Krug but I actually quite like it. It was interesting that again I did not receive any sort of acknowledgement of my Virgin Gold status on either flight which so far is 4/4 where there has been no mention of it. I am not in the slightest bit bothered, but I do find it a bit odd if the crew are meant to do it. The cabin crew member looking after me came to introduce themselves and check I was familiar with the seat as well as taking my pre-lunch drink order and what I wanted to eat. 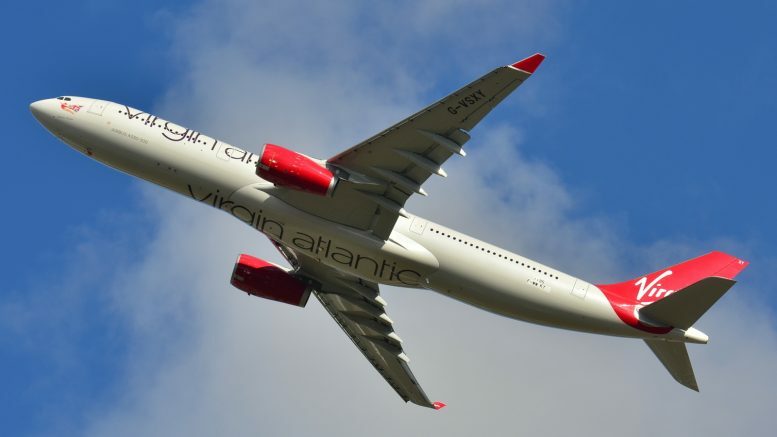 The A330-300 used to be the least liked aircraft in the fleet on Virgin due to the seats which were much shorter than the B787 ones and had little storage space. Virgin, fortunately, decided to refurbish them all fairly recently with the last ones going into service earlier this year. 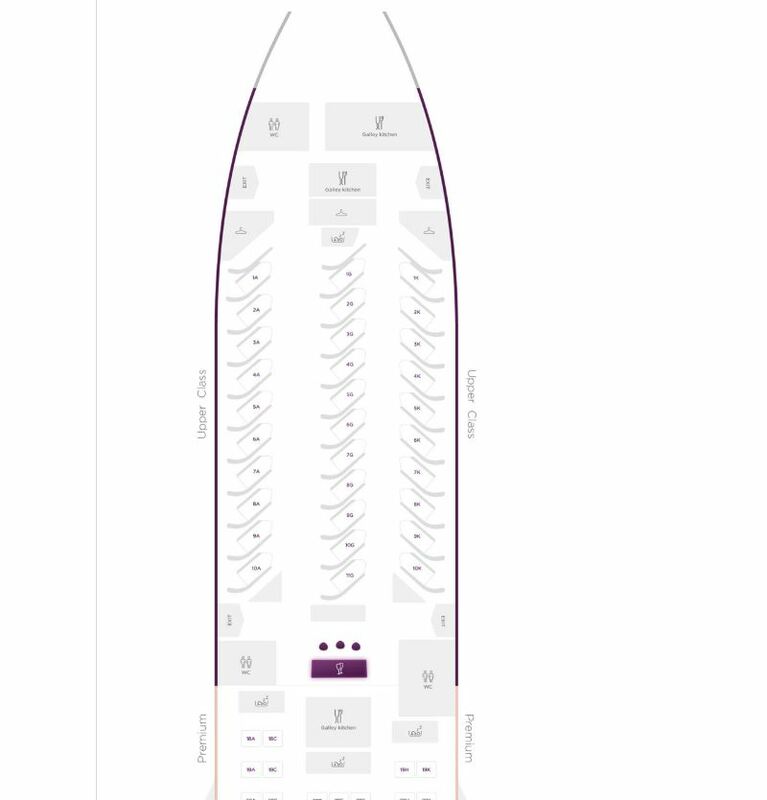 The layout is very similar to the B787 apart from the bar area which is at the back of the cabin perpendicular to the fuselage. I rather like the bar sitting at the end of the cabin rather than the B787 which is in the middle of the plane. 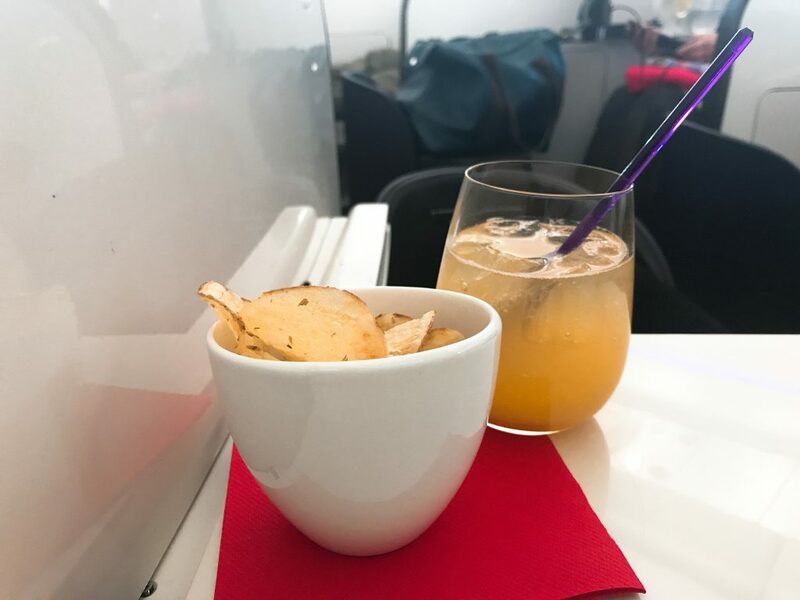 The bar is staffed for part of the flight but there are also help yourself drinks and snacks there during the flight. There are three rows of seats with the best seats being the A side. 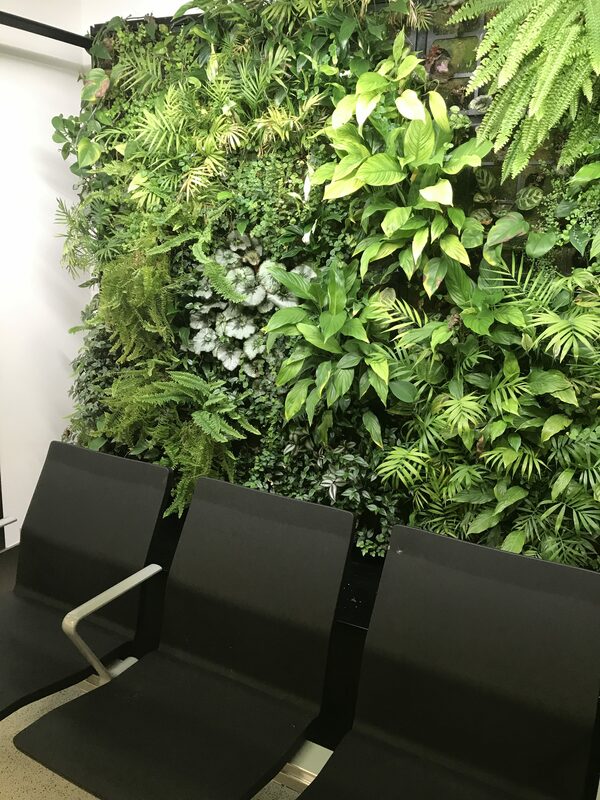 As well as being a window seat they are more private as they face the back of a row of seats rather than the middle G and window K row where you face…. a row of feet! I was in 6G which was all that was left except the last couple of rows of G.
As part of the refurbishment, Virgin put in overhead storage lockers for the middle seats as there were previously none. These were still pretty small though and I only just got my suitcase in. The seats were the standard Virgin ones which have a limited recline and have to be flipped over into a bed. The storage space is a little limited for take off and landing. 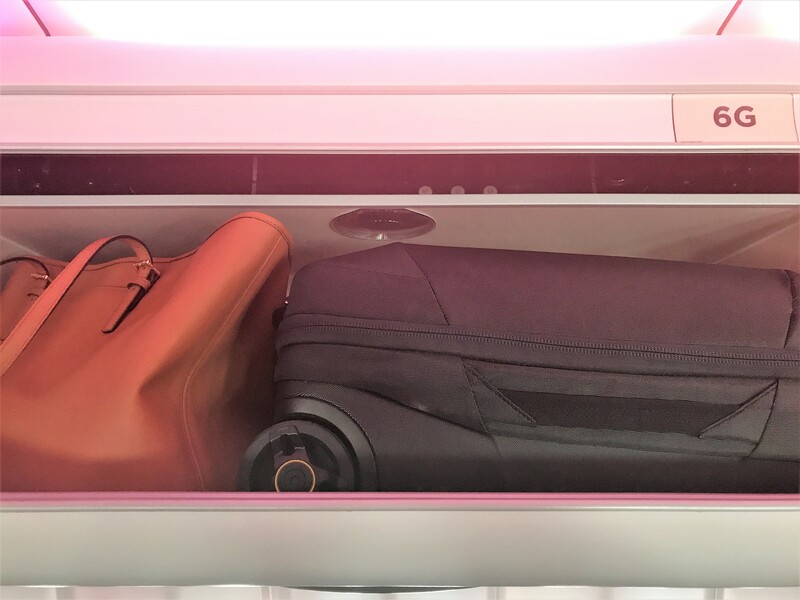 There is a pop up compartment which is big enough to take small items like glasses or a charger and that is about it. After take off there is the flip down drinks tray and also room under the ottoman. You can also store stuff to the side and back of the seat quite easily. I find the seats reasonably comfortable for working and sleeping although I do prefer to have a seat with a big recline. I could reach the foot stool easily even when upright but I would have liked to have a leg rest when relaxing. The crew as usual were very proactive at offering to make up your bed which is a nice touch although I normally just do it myself. The bedding consists of a large pillow with a crisp white cotton pillowcase, duvet and a mattress topper. Although the bed side is a little hard I do find the Virgin mattress topper one of the best out there as it is very well padded. I find the bed pretty comfortable for sleeping and there is enough room for me to sleep on my side. I was slightly torn by the starter as the mushrooms sounded good but I am not keen on tarragon so I went for the prawns instead, big mistake! Whilst the prawns themselves were fine the samphire was one of the worst things I have eaten on a plane. I am guessing it may have been raw or at least it tasted like it. 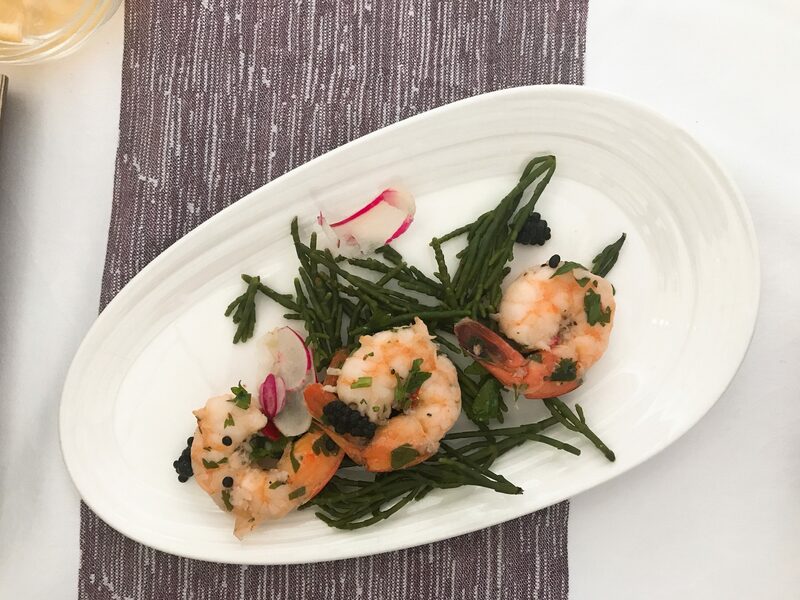 I generally like samphire in a dish as long as it is balanced with less salty ingredients. This was very salty and very, very chewy so I left it all and just ate the prawns. To drink I had the Bourgogne Chardonnay which was pretty average but drinkable. Next, I had the charred cod which had a nice spicy kick to it and wasn’t at all overcooked being still quite moist in the marinade. One of the things I like about Virgin food is they often have a tasty Asian lighter dish on the menu which is perfect for me. I am not normally much of a dessert person but I always end up indulging on Virgin as their warm puddings with a splash of cream are always amazing. This one was no exception despite a slightly misleading description. It was called a tarte tatin but was more like a sponge with an apple tarte tatin topping but it tasted pretty good so I was happy. Sadly I didn’t have room for cheese even though the trolley looked very tempting. 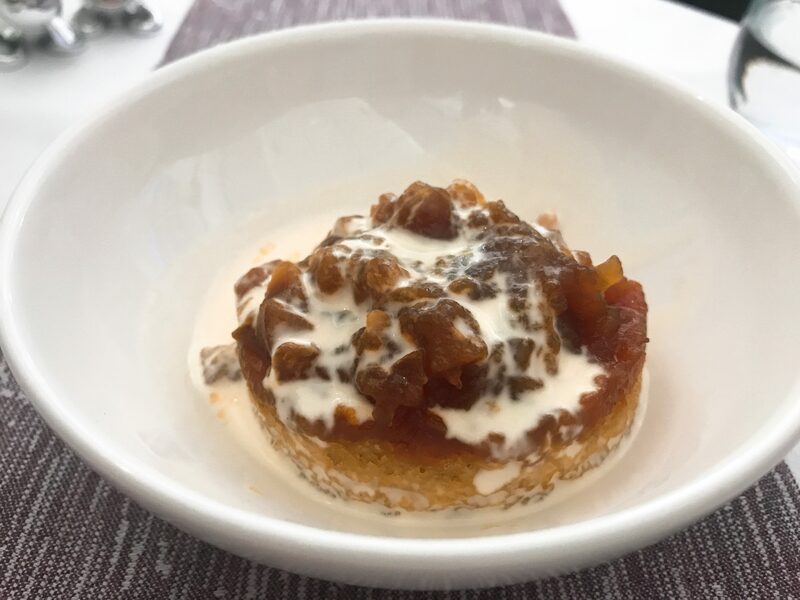 I liked the fact they had onion marmalade to serve with the cheese. 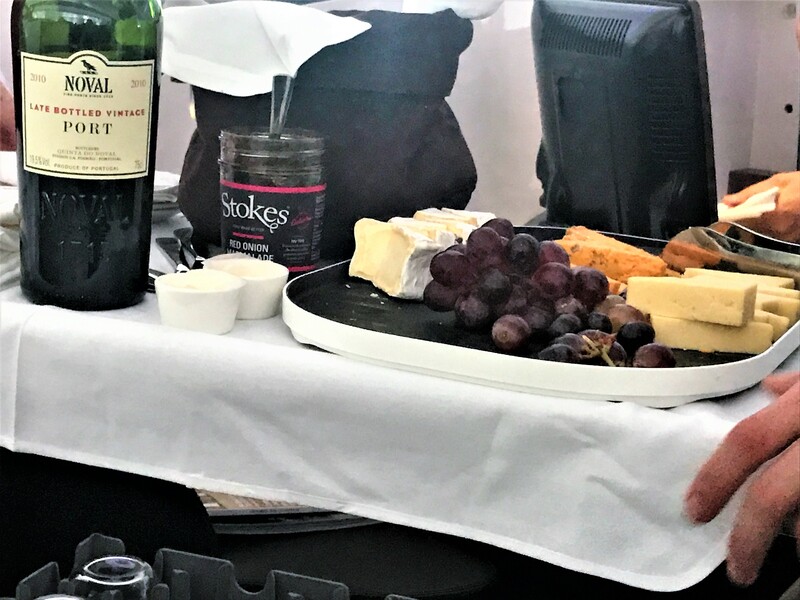 I always think there is something nicer about serving it from a platter on a trolley than just getting a plate of it at your seat. Instead, I finished with a glass of red wine, a Crozes Hermitage, which I enjoyed. 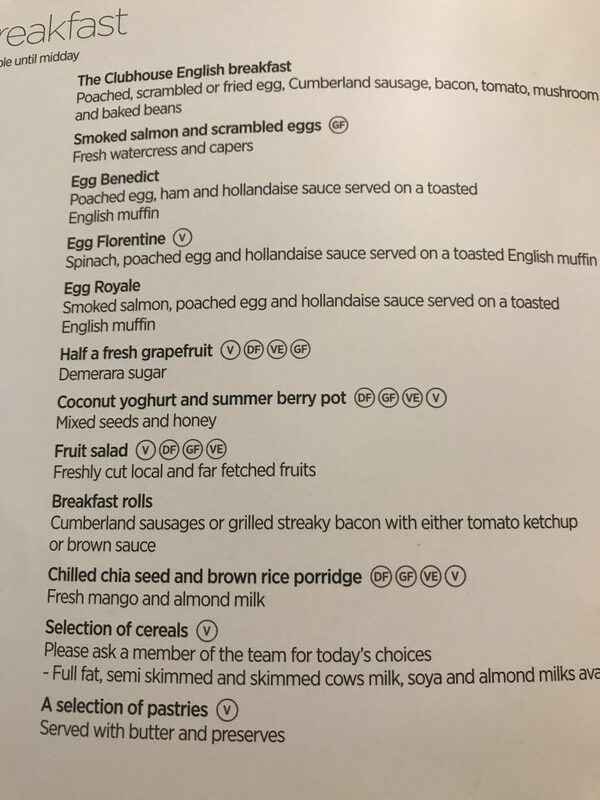 I had been hoping to try the afternoon tea Virgin had recently designed but I really couldn’t manage anything since I was going out for dinner a few hours after landing. The snack selection was smaller than on the West Coast flights but I rarely want a second meal on the shorter East Coast routes so it was fine for me. You could just have the finger sandwiches or the cakes or both if you wished. There was also a burger. 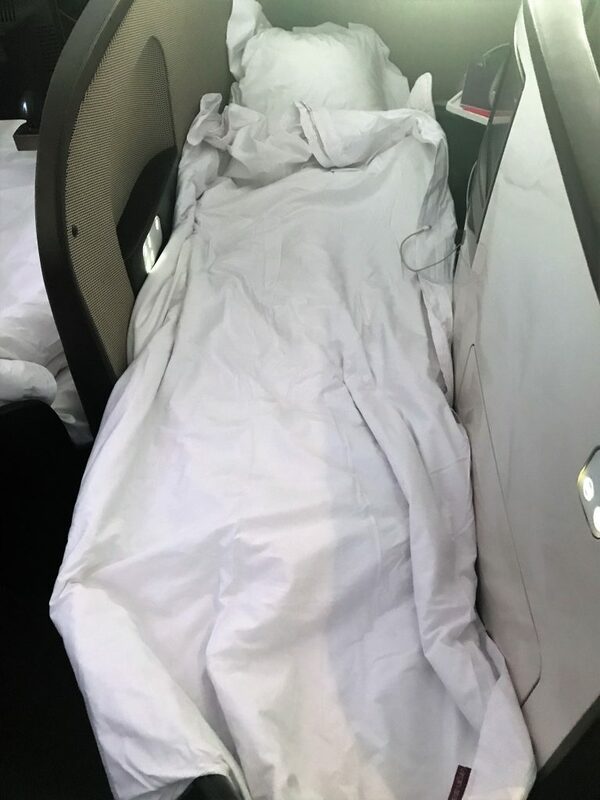 The service was typical Virgin on this flight. Enthusiastic, friendly but not overly formal. I always appreciate that Virgin are pretty consistent for me with good service. My flight home they were not as good but still did the service as expected for the most part and were friendly. The Virgin in-flight entertainment I usually find pretty good in terms of choice. 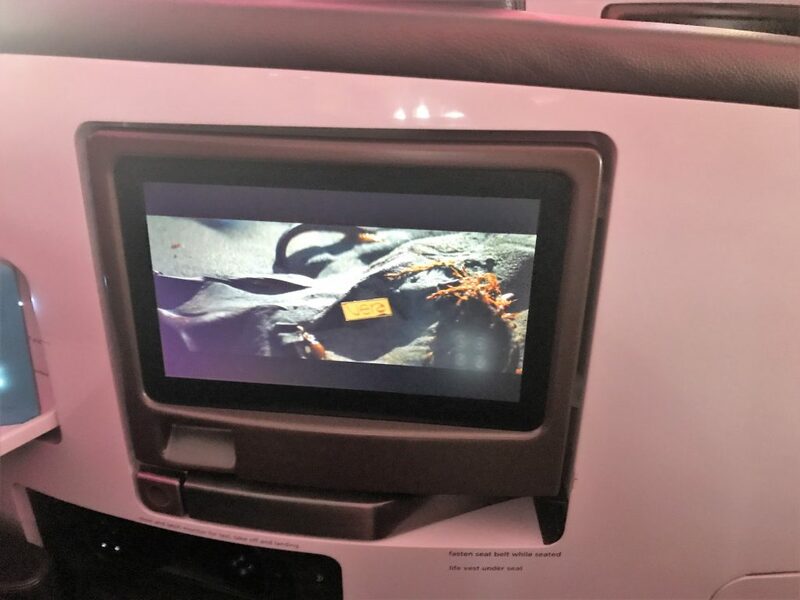 As usual, I found quite a few films and TV programs I wanted to watch but only managed half a comedy film as I was working or trying to sleep for much of the flight. The screens have a reasonable definition but I find them a little small, although they are quite close to you which helps. Noise cancelling headphones are supplied which are OK but not great so I usually use my own on Virgin. There is a multi-country socket and a USB but I do find the USB exceptionally fiddly to use as it is at a strange angle underneath the TV and not easy to see from above. I needed to finish an article so I bought the entire flight Wi-Fi package for £14.99, which I didn’t think was too bad price wise. The speed was nowhere near streaming but it was fast enough for working and uploading photos and social media. The only real complaint is that you can only use it on one device which is irritating if you are trying to do things that require a mobile application such as instagram whilst using a laptop. You can switch pretty easily but it was a lot of hassle as it meant I had to keep stopping what I was going to switch back and forth. 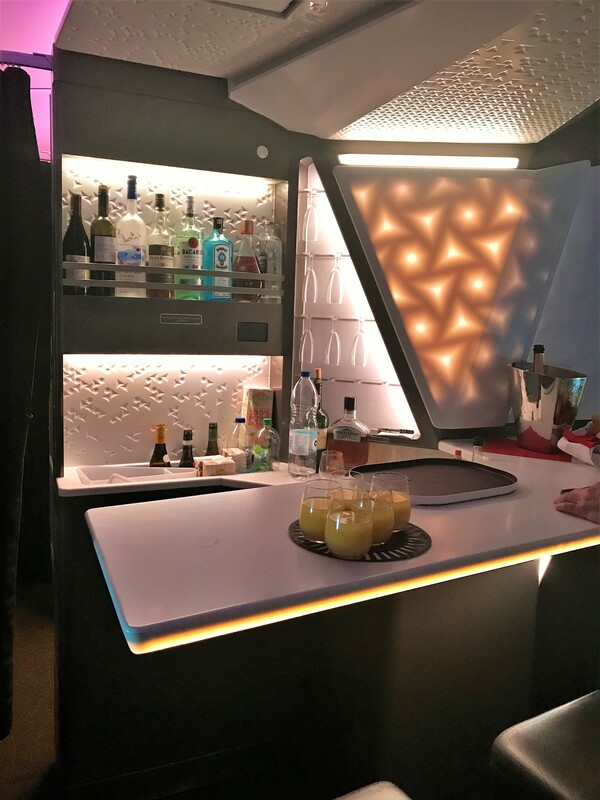 The cabin was a big improvement on the old A330 one and the only real difference from the B787 was the layout of the bar. 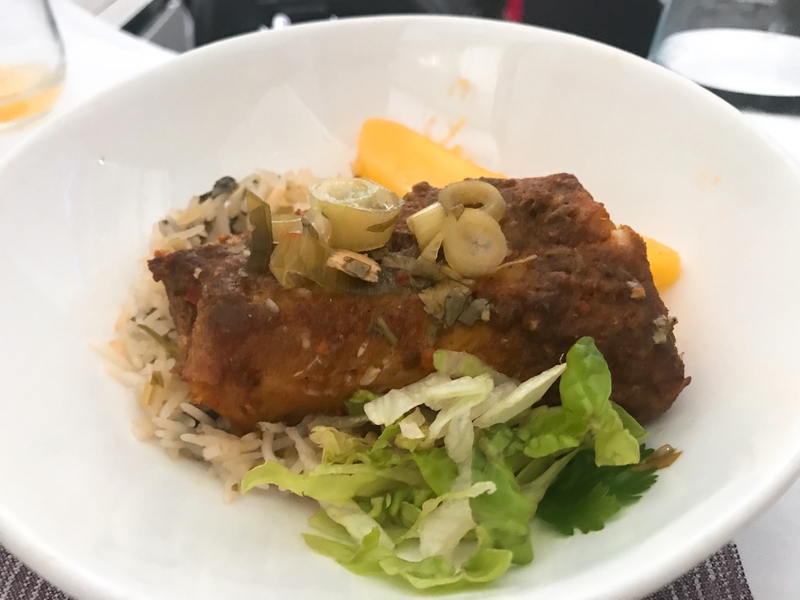 The food wasn’t as good as some of my previous flights with the somewhat disastrous starter, but the crew were as charming as ever. I know a lot of people aren’t a fan of the seats but I actually quite like them for sleeping once you have got them in bed mode. I also like that I can put my feet up on the ottoman from boarding and that the seats are reasonably private and have aisle access. Overall it was an enjoyable flight and I would definitely fly Virgin again in the future. You can find more information on Upper Class here. 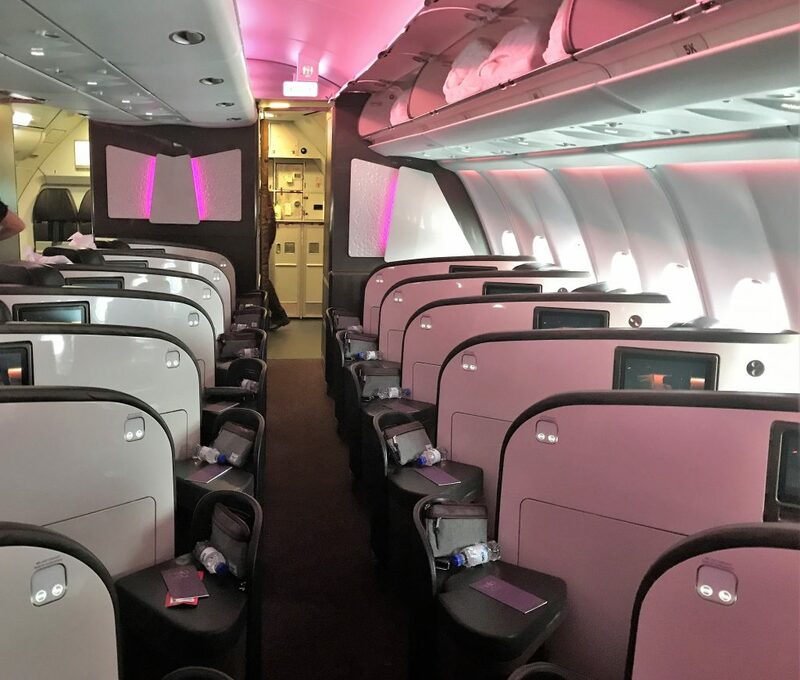 4 Comments on "Virgin Atlantic Upper Class A330-300 (new seats) & Upper Class wing review – London to JFK"
Given the choice VS Upper or BA CW for you ?? I personally am not a fan of the VS seat at all ! How are the seats different. I can’t really see any difference unless I am missing something? 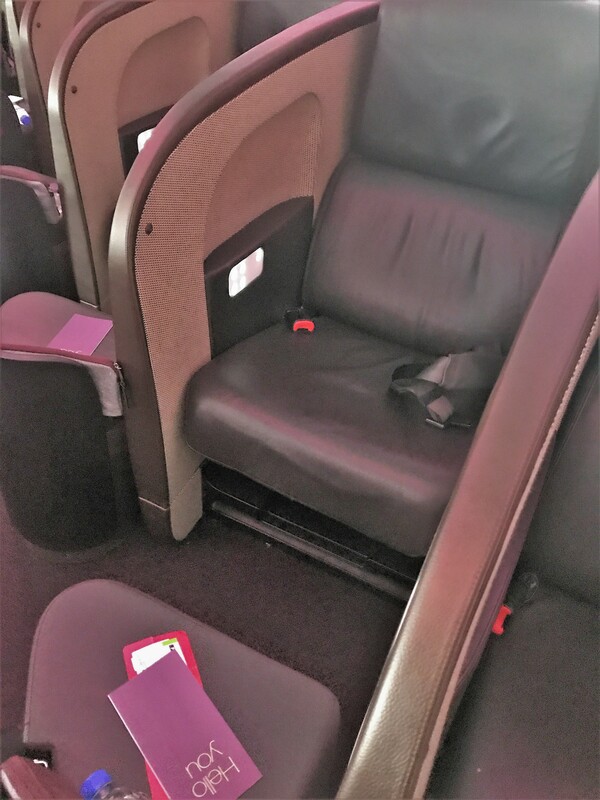 They are different to the standard Virgin Upper Class seats which are flip over design. These have just been updated with new leather etc from the original Air Berlin ones.